Magnetic Snaps in Nickel - 3/4 Magnetic Snaps in NIckel - 3/4 [MsnapN] - $1.50 : PursePatterns.com, Sew your own unique purse or bag! 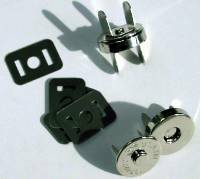 Home :: Bag HARDWARE :: Magnetic Snaps in Nickel - 3/4"
Magnetic Snaps in Nickel - 3/4"
These Magnetic Snaps are 3/4" in diameter and made of metal allow, with Nickel plating. This package is a set that includes 1 male part, 1 female part, and 2 backplates. Slide in Nickel - 1"